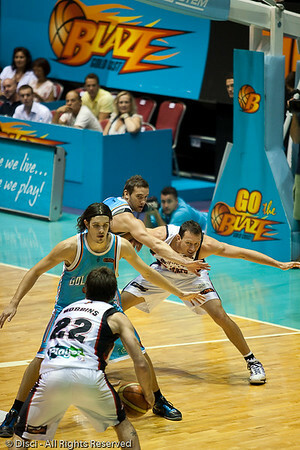 Martin Cattalini seeks a height advantage aginst Adam Gibson in the low post - Gold Coast Blaze v Perth Wildcats Semi-final G2, 23 February 2010. After being down for most of the game, the Wildcats came back in the final minutes to score an 82-78 win. Wildcat import Kevin Lisch scored 11 of his 18 points in the final five minutes to help his team to the win.